EU Directive 2004/48 EC obliges Member States to seek to achieve ‘partial harmonization’ of the remedies, procedures and measures necessary to enforce intellectual property law. These obligations provide what may be termed a minimum standard which must be fulfilled by the Member States in the course of their implementation of the Directive. However, the Directive is not faring well at the Member State level. The three authors’ vastly detailed, article-by-article analysis of the fortunes of Directive 2004/48 EC in three EU jurisdictions offers enormously valuable insights into the complex ways Member States respond to Community law, and in so doing provides an important addition to the ongoing inquiry into the nature of the reciprocal tensions between EU law (both judicial and legislative) and the laws of Member States. the situation in which the relevant time for implementation for the Directive has elapsed and no specific legislation has been adopted (Germany). If there really is, as the European Commission contends, an ‘enforcement deficit’ in the protection of intellectual property rights by national rules of procedure, then the most effective remedial approach, Cummings shows, is through the principles of legal certainty, full effect, and effective judicial protection. These principles will assist the national court in interpretation of the precise meaning of the substantive obligations under the Directive. Drawing on the tenor of ECJ law that national procedural rules should not present an obstacle to adequate judicial protection, the author considers the conditions that must be fulfilled before an eventual claimant, who has suffered loss and damage caused by either the non-implementation or the incorrect implementation of a directive, may bring an action against the State for breach of Community law. 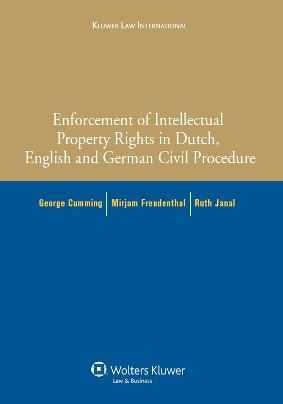 The author presents his analyses of the implementation of the Directive in Dutch and English national procedure and his proposals for German implementation as three separate cases rather than comparatively, as any attempt to compare either the method of national implementation or the degree of adequacy or inadequacy inevitably obscures the essential particularities of each of the three national systems in relation to the Directive. Although this book will repay the study of anyone interested in European law, it will be of special value to practitioners and policymakers engaged in intellectual property law, particularly in EU Member States. Introduction. 1. Obligations and Structure of the Directive 2. Structure of Directive 2004/48 EC. 3. The implementation of Directive 2004/48 into Dutch Civil Procedure. 4. Implementation of Directive 2004/48 EC in English Civil Procedure. 5. Germany. 6. Conclusion. Bibliography. Selected Websites.